In 2007, a school was built in a nearby local village. 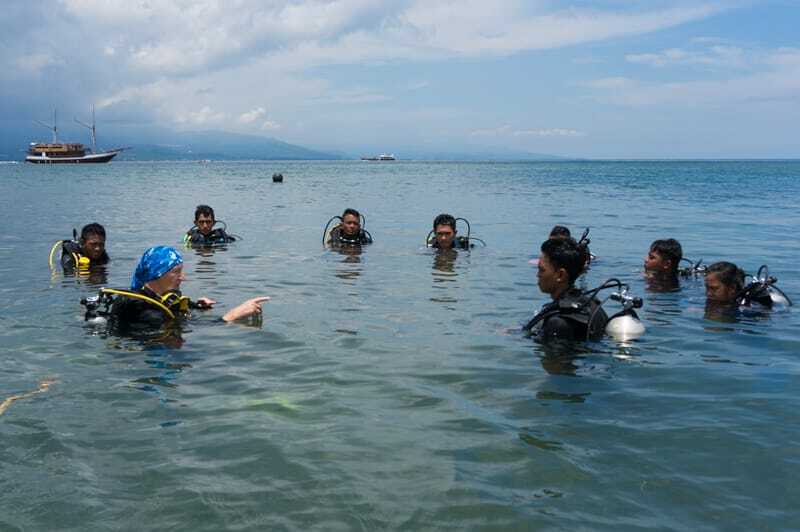 This school not only provides tuition for lesser-privileged village kids in North Sulawesi, but it encourages personal growth and gives them a chance to seek out a career in (diving) tourism. We believe investing in our local communities is extremely important, that's why we educate and train our own dive staff from the ground up. From a young age they learn how to swim first, after which they go through the entire PADI program to become Rescue Diver, Divemaster or maybe even Instructor. Our school is located in a village near Manado, where (besides the government-endorsed curriculums) students learn how to work in the tourism industry as well. Most girls will work in hospitality, while most boys want to be "cool" under water, but there is an promising gender overlap between the two. Every now and then, we have guests who are just jumping at the chance to teach at our school. This is great for many reasons, not least of which the fact that our kids get to do something fun and productive. It breaks their daily routine, promotes creativity and gets them to interact with guests — fun for everyone! « Kehidupan anda » is Indonesian for « your life » and happens to be the name of the Dutch foundation that handles funding, sponsorship programs and donation efforts for the school. With a number of foundation members sponsoring a number of students, the kids have the opportunity to further their education more than they would have without any sponsorship. In fact, a few very generous donors granted university scholarships to particularly eager students. Of course, we can use all the help we can get. We highly encourage you to visit Kehidupan Anda online, and find out more about the foundation, its members and its structure.